Note: This review was originally printed in the Illinois Entertainer. Steve Dawson and his singer-guitarist wife Diane Christiansen have been mixing cutting-edge rock with Country & Western in their band Dolly Varden for years. I Will Miss The Trumpets And The Drums, Dawson’s first solo effort since Sweet Is The Anchor in 2005, offers further proof that he’s a master of this musical hybrid, and shows him drawing from other genres as well. It’s a labor-intensive project that involves him playing several instruments, with occasional help from guest musicians. 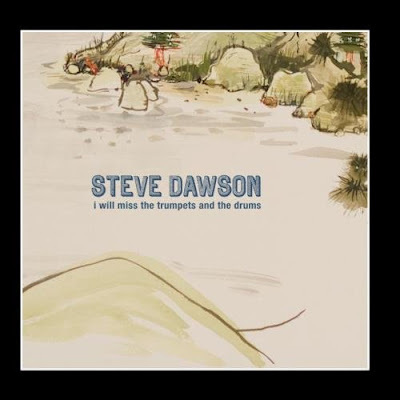 “Today She Found The Way (To Break My Heart)” evokes Van Morrison as Dawson’s soulful vocals exude heartache on lines like, “I never wanted to face this kind of loneliness, but I guess I’m gonna have to start./Because today she found a way to break my heart.” “Goodbye,” which finds Dawson backed by a full band, is another R&B number, and he gets back to country rock on the title track, “Worry Worry Worry” and “Obsidian.” On the short but gorgeous “I Wish That I Could Believe In You Again,” Dawson creates multiple layers of his vocals, while on “Long Overdue,” he opts for a more basic approach, like he’s performing live in a small club. I feel totally vindicated. For the past few weeks, I’ve been riding around my home town of Palatine on a horse, telling everyone to come to The Smithereens and The Bad Examples concerts at the Downtown Palatine Street Fest. Well, I didn’t ride a horse so much as write a preview for the TribLocal and talk to a few of my neighbors. For power pop fans in Palatine, this was the most exciting event here since the Underground Garage Tour (minus Little Steven, unfortunately) came to Durty Nellies, with The Zombies as headliners. As I predicted, The Smithereens played a few songs by The Who and The Beatles along with their own high-powered hits, and The Bad Examples evoked Squeeze with their clever word play and infectious melodies. The Smithereens took their usual workmanlike approach, quietly walking on stage a little after 10PM Saturday night, with no introduction or fanfare. They ran through a selection of originals before lead vocalist-guitarist Pat DiNizio mentioned The Smithereens had recorded their own version of The Who’s Tommy. This led to a lively rendition of “House We Used To Live In” that segued perfectly into powerful versions of “Sparks” and “The Acid Queen” from The Who’s rock opera. They only played one song from their pair of Beatles tribute CDs this time out, choosing “Ask Me Why,” from B-Sides The Beatles. The temporary stage was set up in a parking lot, and as the band played songs like “Top Of The Pops,” “Behind The Wall Of Sleep,” “Especially For You,” “Spellbound” and “She’s Got A Way,” I was able to wind my way through the crowd until I was close enough to feel the Severo Jornacion’s bass and Dennis Diken’s drums kicking against my chest like a giant foot. Afterward, band members came out to sign autographs and give away Smithereens 30th Anniversary guitar picks. Three decades is a long time for a group to stay together, but The Smithereens have managed that feat by creating great songs and connecting with their fans. 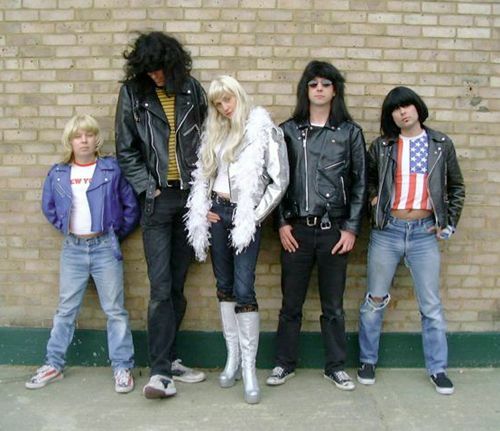 The Bad Examples’ performance at 4PM on Sunday came 25 hours after lead vocalist-guitarist Ralph Covert had Palatine parents and kids dancing and singing along with the silly but engaging tunes from his highly successful Ralph’s World CDs. For my full review of the Ralph’s World concert from last year’s Downtown Palatine Street Fest, see Pure Pop For Knee High People under Archive, August, 2009. Downtown Palatine Street Fest also presented acts on the smaller gazebo stage, including Covert’s daughter, Fiona Grey and her guitarist/co-writer Matt Pingel. Although only in her mid-teens, Grey is already a polished performer with a good voice in the vein of Feist or Ingrid Michaelson. The duo’s mix of covers and originals lean more toward indie rock than the old man’s power pop or kids’ fare. Covert’s work with The Bad Examples is notably harder-edged and more adult-oriented than what he does for Ralph’s World, but throughout both concerts, he exuded the enthusiasm of a kid having a blast on the playground. Backed by guitarist Tom O’Brien, the only musician other than Covert who’s in both lineups; drummer Larry Beers; bassist Tom “Pickles” Piekarski; and guitarist Steve Gerlach, Covert belted out familiar tunes like “Me And My Near-Blind Hindsight,” “A Mindless Pop Song,” “Let Her Go,” and “One Perfect Moment.” “Any Twisted Thing” had more of a funk rock feel, and as usual, “Not Dead Yet,” the rollicking hit that still garners regular airplay on WXRT, had just about everybody in the crowd joining in. New songs, like the catchy “Pictures of a Masquerade” and taunting “I’m Still Living With Your Ex-Girlfriend,” as well as “You Don’t Understand Me,” a slower tune about a relationship coming apart, bode well for the new CD The Bad Examples plan to release this Fall. Another new song, which I’m guessing was called “Kill Amanda,” had the feel of classic Squeeze material. The Bad Examples closed their impressive set with the energetic “Let Her Go,” from the CD, Popscape - The Best of Ralph Covert And The Bad Examples. It was a kick having The Smithereens and The Bad Examples playing outdoor shows in Palatine over the same weekend, and fortunately, the weather cooperated perfectly. At least two people like this album. Long Live Garage Rock. I’m having a Rock & Roll Garage Sale this weekend, specifically timed to align with the Downtown Palatine Street Fest, which is taking place about a block away from my house. I’m selling CDs, vinyl, publications, and cassettes. I placed an ad in the local paper, listed my event on CraigsList, and posted signs around the neighborhood. Business was sporadic today, but I made enough to cover the ad, with a little left over. Whatever I make tomorrow will add to my profit margin. After hustling to get all my merchandise outside for the 8AM grand opening, I sat alone for over an hour before anyone stopped by. Having the sale felt a bit like entertaining guests, as I talked with people about various bands, past work experiences, and various other topics. One young woman asked if I had any Grateful Dead or Pink Floyd stuff. I said I had Pink Floyd stuff inside, but it wasn’t for sale. She explained that she needed to find two more albums and then she would have everything Pink Floyd put out on vinyl. 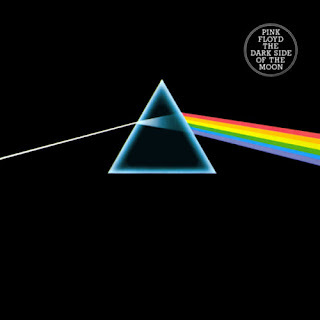 When I mentioned I had a friend who was the biggest Pink Floyd fan in the world, she just laughed and said, “Wanna bet?” Hopefully, there will be more conversations and sales tomorrow. So far, the Street Fest doesn’t seem to be helping sales, though. Hollus Happenings. Hollus might be rocking out at the Martyrs’ club as you’re reading this. The Chicago-based band is part of a four-act Booze Rock showcase tonight that also includes The Dirty Rooks, The Delta Routine, and Thunderbird Kingsley. The music starts at 9PM. Hollus will be following up on its impressive Joker And The Queen CD by releasing a pair of EPs. Part One drops in November, with a TBA release show planned for late October. Can’t Stop The World. After selling out the first installment of her first Lady Robitika comic book, Jane Wieldlin now has a second one on the way, titled, Of G Strings and Galaxies. Her Facebook page says it should be available at your local comic store. They Say It’s His Birthday. Black Forest will be hosting a tribute to John Lennon to celebrate what would have been his 70th birthday, and is seeking performers to play his music. The songs can be from Lennon’s solo repertoire, or his earlier work with The Beatles. The show will be held from 8:00 to 10:30PM on October 9th at the Black Forest space at 512 Kedzie in Evanston. Contact James Moeller at jamesblackforest@yahoo.com for information. Beatles By The Books. The Niles Public Library has an entire month of Beatles related fun on tap, including screenings of Sgt. Pepper’s Lonely Hearts Club Band on September 18th, and A Hard Day’s Night on September 21st. There will be a Beatles Rock Band Tournament on September 19th, and on September 22nd, photographer Jorie Gracen will discuss her experiences with Paul McCartney. Walter Podrazik, who was recently on hand at the Fest For Beatles Fans in Rosemont, will host a Beatles Trivia Challenge on September 26th, and The Threetles, a trio comprised of musicians Eric Howell, Michael Mahler, and Frank Canino, will celebrate John Lennon’s birthday on October 9th with a live performance. WXRT DJ Terri Hemmert will serve as MC for an Invitation Only Beatles Art Show and Closing Ceremony on October 15th. All of the artists who submit displayed artwork will be eligible to attend, and there will also be a drawing for anyone who comes to the library to vote for a special People’s Choice award. The latest entry in an ongoing series devoted to magazines of the past. Here’s a publication I won’t be putting up for sale at my Rock & Roll Garage Sale this weekend. 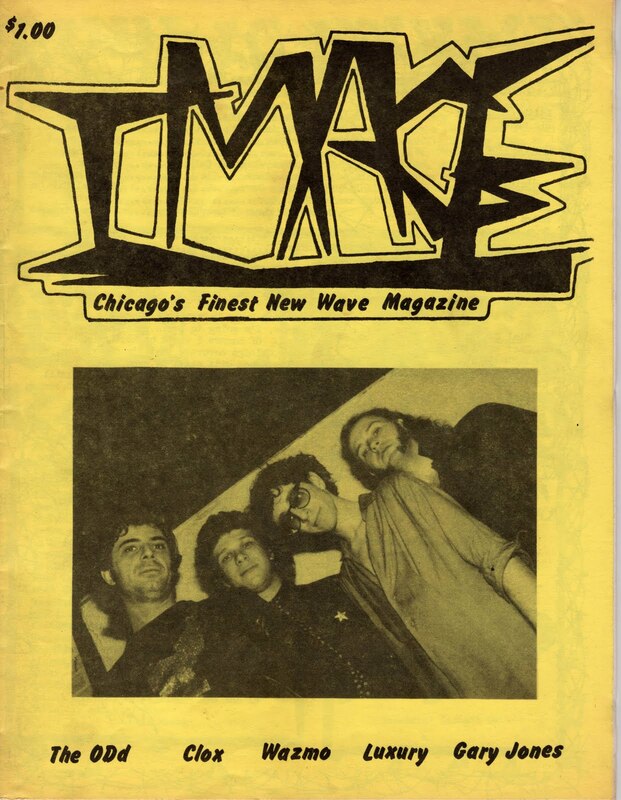 Billed as “Chicago’s Finest New Wave Magazine,” Image certainly had some impressive credentials. Ric Menck, who was a founding member of The Reverbs and would later go on to Velvet Crush and several solo projects, served as the Editor/Publisher, and the contributors included Cary Baker, Rachael Cain, and Moira McCormick. Linda Matlow, who took the cover photo of The ODd for this particular issue, headed the photographers staff. Oddly enough, or ODdly enough if you prefer, there’s no date on this issue, but if Menck was reviewing Bohemia’s Automatic Mind/Unconventional Boy/American Life EP as a current release, that would make the year 1980. Menck’s extensive feature on The ODd revealed that lead singer-guitarist Hugh Hart was tired of being compared to Elvis Costello, and Clox lead vocalist-guitarist Terry Fox requested that McCormick describe his group as “a modern-dance-rock band” rather than as “new wave.” Baker used his I Dig The Nightlife column to provide a rundown on what was happening at clubs like Oz, Gaspar’s, Rut’s, Neo, Lucky Number, O’Banion’s, Huey’s, and Biddy Mulligan’s. Dave Luhrssen reported on the Milwaukee music scene, and Cain, who fronted the band Screamin’ Rachael and Remote, filled readers in on what was going on at Space Place. Gary Jones was one of my favorite local bands at the time, and I was (and still am) particularly fond of “Underground,” the B-Side of the catchy “Friction.” Years later, I would see Gary Jones singer Toby Masters participating in a multi-media stage show that also included two former members of my Famous In The Future comedy group. Small world. The only ad in the decidedly do-it-yourself Image was on the back cover, and it was for the Wax Trax record store on Lincoln Avenue. Portrait of the artist as a Comic Con man. Photo of Steve Guzelis (left) and a colleague taken from Steve's Facebook page. It’s been a while since I bought a comic book, but there’s something about events like Wizard World’s Comic Con that dazzle my imagination. Held at the Rosemont Convention Center this past weekend, it featured tons of vendors selling comic books, games, t shirts, action figures, Jedi laser swords, and countless other fantasy and sci-fi related artifacts. Some people came dressed in super hero costumes, and where else are you going to see Captain Jack Sparrow and Harry Potter walking side by side? Perhaps the biggest draw for most people is the chance to meet with celebrities. This year’s guests included William Shatner, Linda Hamilton, cylons from Battlestar Galactica, Adam West & Burt Ward from Batman, Julia Jones, and James Marsters. It’s also a place where large media corporations, as well as individual artists, come to hawk their wares. I encountered an attractive model in a revealing school girl uniform who was hyping a graphic novel called Bad Kids Go To Hell. I told her the art was very good as she stood by my side slowly turning the pages, and she readily agreed. Bad Kids Go To Hell will also be coming out as a motion picture. A young guy representing Carpe Chaos handed me a postcard for the new online comic, and pointed to some art work attached to a board. “You can pick any of that art and we’ll give it to you,” he said. SuicideGirls, a racy and cutting edge website had two new DVDs for sale. Artists Alley is a sprawling marketplace where artists compete for attention from the people passing by. A lot of the work here was interesting, from artists and publishers like Alan S. Dyson, Chuck Perkins, Little Eva Ink, Sean Forney, David Mack Guide, Astounding Tales Comics, Jason Chalker, G2 Comics, Rob Hassan, and Ken Branch. 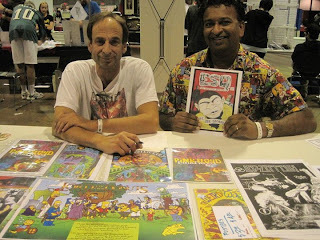 I ran into Steve Guzelis of Strange Fun Comics, who sold me a couple posters at last year’s Comic Con, and who also created a poster of The Hollies for me. He’s been a great sport about my using one of the posters, Bands Of The Psychedelic 1960s, as a running gag in my Manchester Gallery online sitcom. It turns up again in the episode that will be on this week's Sunday Morning Coffee With Jeff. Wandering through the celebrity area, I stopped and had a friendly talk with Ernest Thomas, who was well known for his role of Raj on What’s Happening, and more recently played Mr. Omar on Everybody Hates Chris. I also shook hands with Larry Thomas (no relation to Ernest) and remarked that his Soup Nazi on Seinfeld was probably one of the most imitated characters on American television. Mickey Dolenz left his booth just as I was approaching, so I didn’t get a chance to voice my support for The Monkees being inducted into the Rock And Roll Hall Of Fame. It was a kick seeing supermodel Angie Everhardt, as well as Bess Motta from 20 Minute Workout and The Terminator, but I wasn’t sure what to say to them. I spotted Linda Blair from behind, and was afraid her head would suddenly spin around to confront me. There were a lot of strange sights at Wizard World’s Comic Con 2010, but that would have been a little too much to handle. Photo from The Plagiarists Facebook page shows Ryan Palmer on left; Gregory Peters on right. As I arrived at the Mary-Arrchie Theatre a little after 3PM this past Saturday, Artistic Director Rich Cotovsky was getting psyched for his role as Rex in Matt Borczon’s short piece Wild Dogs. Cotovsky has performed in this two-man tragicomedy at every Abbie Hoffman Died For Our Sins festival since 1989, pretty much with a different co-star each time. Wild Dogs, a tale of a deranged loner who takes in a timid businessman who’s been tossed out by his wife, exudes an in-your-face attitude that’s well-suited to the Abbie Fest and the Mary-Arrchie itself. The theatre group has always aimed for a streetwise grittiness. Cotovsky held up a package of Twinkies, much to the delight of the audience, and as Wild Dogs unfolded, he rewarded their enthusiasm by tearing it apart with his teeth. With whipped cream smeared across his nose and beard, he howled and scampered on all fours, before taking a massive swig of Mad Dog 20/20. The Abbie Fest was set up as theater in the round this year, and sitting so close to the action, I was able to appreciate the various comic nuances Cotovsky continues to bring to a role he has performed numerous times. Abbie Fest likewise continues to entertain and surprise as it charges into its third decade. Longtime fans are familiar with the nonstop schedule that kicks off at 7PM on Friday and runs through late Sunday night; the eclectic mix of seasoned professionals and mistake-prone rookies tackling everything from Harold Pinter to an early hours talk show about oil; and above all, the sense of support within Chicago’s theatrical community. The artsy, dramatic ambience of the Abbie Fest’s earliest days has given way to a raucous party spirit, and there are a lot more comedy groups on the schedule now. So there was something reassuringly old school about watching members of the Dandelion Arts Center performing A General Revue of Dorothy Parker’s Situation by Brooke Johnson and Dina Marie Klahn. It wasn’t clear if this was a straight up presentation of the witty Parker’s own words, or a work that was inspired by her. Either way, a likable cast breezed through clever scenes with well-crafted dialogue. No belly laughs, but definitely satisfying. Later that day, Lance Eliot Adams, who has been affiliated with Mary-Arrchie for several years, read from his own novel, A Voice I Heard. Black Forest Theatre founding members James Moeller and Carla Hayden have been gracing the Abbie Fest with their off-kilter charm for several years now. Their latest piece, The Dogstar Rages, was penned by Moeller, and displayed his usual fascination with clever word play and quirky characters. Existential Crisis, a duo comprised of Matt Peterson and Mike Cherry, poked fun at various conventions of theater and sketch comedy, like banging into each other during a blackout, or jumbling various elements of Shakespeare. They finished with a funny but poignant bit about a guy who’s devastated to learn that his hero from back in their high school days wasn’t the sexual stud his overblown reputation made him out to be. Journalistic integrity should prevent me from reviewing a performance by Famous In The Future, the group I spent 20 years writing and performing with, but what the hell, this is a blog. FIF used clever dialogue and imaginative costumes in a funny opening bit that mashed Alice In Wonderland with the current Tea Party movement. Long time member Desiree Burcum’s original song exploring how America embraces mediocrity scored some major hits on current celebrities. A sketch about two mountain climbers debating whether they should save the life of a circus clown who had fallen into a ravine was laugh out loud funny, especially for those of us familiar with founding member Frank Carr’s pathological fear of clowns. A.S.S. IV by The Plagiarists once again featured the hysterically funny Gregory Peters portraying a pompous professor introducing the works of an obscure (purely fictional) playwright. The revue bounced between rapid fire eloquence to can-you believe-we’re-actually-doing-this-onstage gross-outs, with the highly polished cast somehow holding the insanity together. At this point it was after 10 o’clock, and the huge crowd that had gathered in the Mary-Arrchie’s storefront venue on Sheridan Road made it impossible for audience members sitting toward the back to see much of what was taking place. But there was a positive vibe in the air, and for those of us who have been coming every year since Abbie Hoffman Died For Our Sins I, it was great to see this freewheeling celebration still going strong. 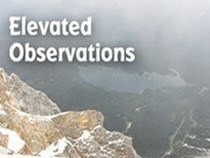 A regular feature where I present a review or article I wrote in the near or distant past. It takes its name from a line in a sketch Dave Drazin once wrote for the Famous In The Future comedy group. 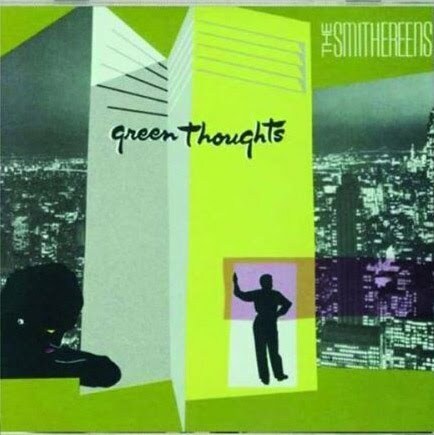 This time, it’s a review of the 1988 Green Thoughts LP by The Smithereens in honor of their coming to my home town of Palatine five days from now. The band played at least a few of the tracks from this release when I saw them at an outdoor gig right next to Wrigley Field about a year ago. My preview of the this year’s Downtown Palatine Street Fest, which includes profiles of The Smithereens and The Bad Examples, is currently up on the TribLocal blog. Hopefully it will be in the printed edition of TribLocal that’s included as an insert in Thursday’s Chicago Tribune. The Smithereens did such a bang up job of updating the spirit of 1960s style rock on their debut Especially For You, it should come as no surprise to find them continuing in that vein on the follow-up. Green Thoughts, with producer/musician Don Dixon back at the controls, offers more of the catchy melodies and ringing guitars that have made The Smithereens a favorite of power pop fans since their EP, Beauty And Sadness was released five years ago. Lead singer Pat DiNizio shows his usual flair for songwriting, switching from hard-hitting numbers like “The World We Know” and “Only A Memory,” which features Marti Jones on back-up vocals, to the lighter “Something New” and “Elaine.” None of these tracks have the immediate impact of “Blood And Roses,” which fueled the massive success of Especially For You, but there’s still plenty of fun on Green Thoughts. Gabba Gabba - - - Hey This Is Funny! 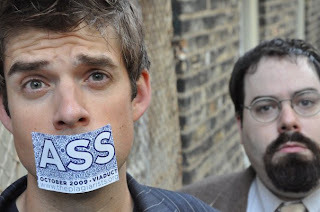 Kudos to Chicago musician Brian Wade Dunn for posting a Facebook link to the GABBA page on MySpace. Mashing the manic Gabba Gabba Hey spirit of The Ramones with the melodic high drama of ABBA is an extremely clever concept, and GABBA, which lists its members as Geeky, Anneky, Bjoey Bee Bee, and Abby, pulls it off perfectly on “The Pinhead Takes It All,” “SOS,” and “Mama Mia.” The band’s debut Leave Stockholm is now available. Time For Go Time. In addition to its admirable devotion to posting rock stars’ birthdays on Facebook, the Chicago power pop band Go Time creates hard-edged, melodic songs like “Rust To Rust” and “Broken Retrofit.” The band will be performing Saturday night at Silvie’s Rock Room on Irving Park Road on Chicago’s north side. The show starts at 10:00 PM. Give The Finger A Round Of Applause. Palatine-based techno rockers Dot Dot Dot have created an oddly animated and funny video for their radio friendly tune “Around The World (And Back).” The band members are represented by fingers that perform and visit famous sites around the globe. Rocking In Palatine. The Mint Julep Room in downtown Palatine continues to pursue an eclectic booking policy that includes jazz, blues, and rock artists on Friday and Saturday nights. Tonight, the venue hosts Liz Mandville, a powerful singer-guitarist who has released four critically acclaimed CDs. Mandville has played the Chicago Blues Fest, and has had gigs across America and in Europe. She’s an engaging performer who actively seeks to connect with her audience. Tomorrow night, the band Triadd drops by for a night of acoustic rock covers graced with Crosby, Stills, & Nash style harmonies. Triadd will also be at The Mint Julep Room, which serves sandwiches, pizza, and salads, on September 3rd. Isn’t He Romantic? Brad Elvis of The Handcuffs will be traveling to the Atlantic City Hilton Casino Resort in New Jersey next Friday for one of his regular gigs as the drummer for The Romantics. Meanwhile, Brad and vocalist Chloe F. Orwell are putting the finishing touches on the next CD from The Handcuffs. Round and Round. Singer-songwriters Dean Milano, Jay Whitehouse. Shelley Orbach, Jordi Kleiner, and Melanie Budd will be performing The Song Circle at the North Shore Unitarian Church in Bannockburn, Illinois tomorrow night, from 7:30PM to 10:00PM. The Two Lifejackets Theater Company will be adding comedy sketches to the proceedings. Suggested donation is $7.00. IPO Tracker. This weekend finds David Bash and his traveling power pop extravaganza International Pop Overthrow camped in Seattle. Josh Schroeder, Dave Rave, Sorry, The Femurs, Ed Hale, Lund Brothers, and GE5 will be cutting loose at El Corazon Lounge tonight. Tomorrow night, the same venue plays host to Gavin Guss, The Orchid Highway, 80:20, Half Acre Day, Poland, Chris von Sneidem, and Starry Eyes. IPO moves up to Vancouver, Canada for a five night run at The Railway Club, starting Tuesday, August 28th. Back To School Promotion. Las Divas Promotions will be sponsoring an Old School Metal and Punk event featuring a DJ spinning vintage vinyl at The Exit (appropriately enough) in Chicago tomorrow night. The mayhem starts at 10:00PM and runs through 4:00AM. Hippie Hippie Shake. And don’t forget, Abbie Fest XXII kicks off tonight at the Mary-Arrchie Theatre on Chicago’s north side. 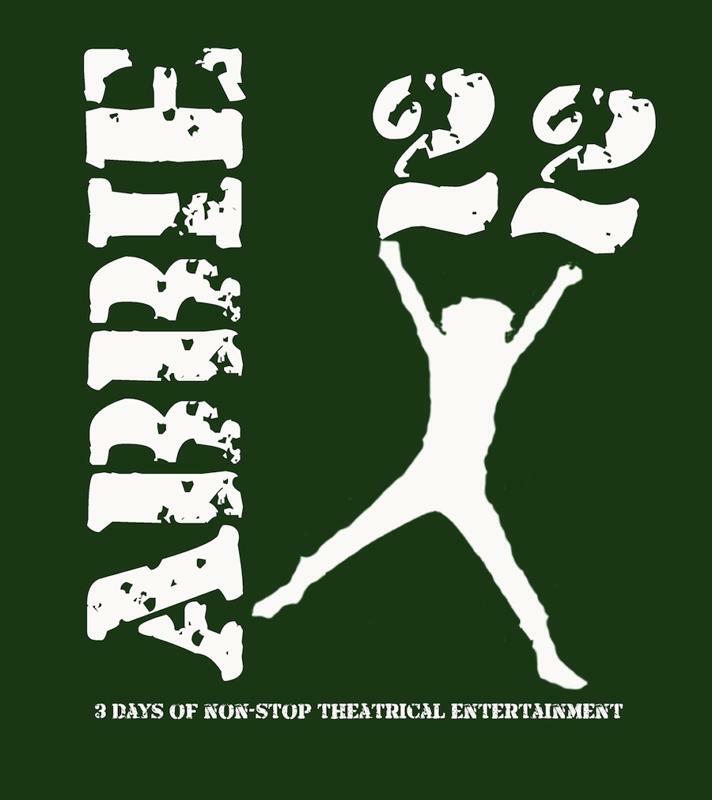 It’s a weekend-long wild ride with Abbie Hoffman impersonator and Mary-Arrchie Artistic Director Rich Cotovsky at the wheel. Tonight’s highlights include Rush Pearson’s amazing one-man show, Diary Of A Madman at 8:00PM, Mary-Arrchie’s Gas Mask 101 at 10:00PM, and for those either willing to spend the night or get up very early in the morning, A Red Orchid Theatre’s Oil Talk, at 5:00AM. Graphic taken from 2010 Abbie Hoffman Died For Our Sins Fest t shirt. These t shirts will be on sale at the Fest. You might see a small band of rebels in the Daley Center tomorrow afternoon, but it won’t be a scene being filmed for Transformers 3. The guy with the megaphone and unruly hair is Mary-Arrchie Theatre Artistic Director Rich Cotovsky, and his devoted followers are actors. They’ll march northward until they reach the Mary-Arrchie Theatre at the corner of Broadway and Sheridan Road. Yep, Abbie Hoffman Died For Our Sins XXII has arrived. The virtually nonstop three-day celebration of theatre, performance art, comedy, and music will once again exude a freewheeling 1960s vibe that kicks off with an Opening Ceremony that features Cotovsky channeling the spirit of Hoffman. As usual, some big players on the local scene are involved; like A Red Orchid Theatre doing Oil Talk, Rush Pearson doing Gogol’s Diary Of A Madman, The Factory Theater doing The Popeye Chronicles, and The Factory Theater Alumni doing The Mystery Of Pink Floyd. Unfortunately the Mary-Arrchie Theatre itself won’t be performing its current hit Cherrywood, (it’s been extended through August 28th) as part of Abbie Fest, but the group will be performing Wild Dogs and Gas Mask 101. Over the years, Citizens’ Relief, Rare Terra, Theatre O’ Th Absurd, The Plagiarists, and Bruised Orange Theatre have put up interesting shows, so they should be worth checking out this time around. Several other performances look promising. Part of the fun at Abbie Fest is never knowing what to expect. In addition to showcasing a wealth of local talent Abbie Fest also provides a supportive atmosphere in which new groups can get their feet wet. I took part in this annual ritual for 20 years as a member of the Famous In The Future comedy group, and have too many fond memories to go into here. My old mates are still active, and this year, they’ll be offering a revue of scripted material called Famous In The Future in 3D. Longtime cast member Desiree Burcum, who has an obsession with puppets, warned on Facebook that some puppets will be involved with this year’s production. Founding member Frank Carr is the only individual other than Cotovsky, who has performed in every single Abbie Fest. Famous In The Future in 3D is slated for 7:00PM Saturday night. A few hours earlier, James Moeller and Carla Hayden of Black Forest Theatre will perform The Dog Star Rages at 4:45PM. Moeller has been talking up the original 30-minute piece, which also features Maurice Cleary, on his JimmyDumps/SunnyJimmy blog and it sounds like another winner from the always offbeat but genial Black Forest Theatre. This is a regular feature where I present a review or article I wrote in the near or distant past. It takes its name from a line in a sketch Dave Drazin once wrote for the Famous In The Future comedy group. 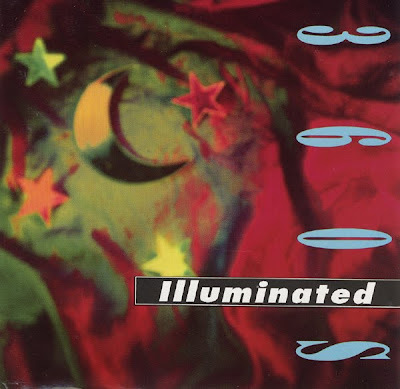 This time, it’s a review of Illuminated, the debut CD from Boston band The 360’s. This review ran in the Illinois Entertainer back in 1991. The 360’s released a few more very good CDs after this, and I once had the pleasure of doing a phone interview with lead vocalist-guitarist Audrey Clark prior to them coming to Chicago for a gig at The Metro. Unfortunately, this powerful and interesting group never caught on, and has long since broken up. The 360’s, a new band from Boston, pack so much raw energy and street attitude into “Deadpan Superstar,” the first track on their debut, you just know the next nine cuts are going to be something special. Illuminated delivers on that promise, thanks mainly to the androgynous vocals of Audrey Clark, who at times could pass easily for Let’s Active’s Mitch Easter of Game Theory’s Scott Miller. She fronts a band that shifts gears from catchy pop to punk to lush psychedelia, with guitarist Eric Russell frequently adding a hard rock edge. Clark evokes Chrissie Hynde on the more frantic tracks like “Death Defies Me” and “Put That Behind Me.” She softens her approach on the dreamy acid pop of the title track and “Garden Of Departure,”and even sounds vulnerable on the romantic ballad, “Saved.” “It,” which borrows heavily from The Beatles’ “Rain,” and “What We Are” give Clark a chance to work in a more traditional pop setting. More reflections on The Fest For Beatles Fans - Chicago 2010, which was held at the Hyatt Regency in Rosemont this past weekend. 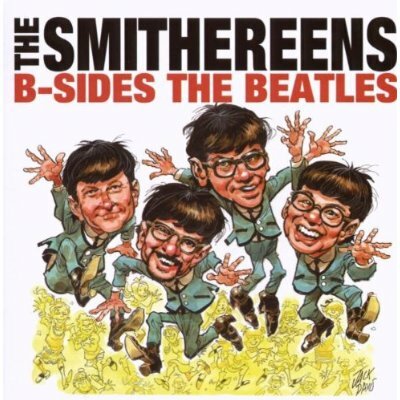 A Beatles Storytellers session featured Pat DiNizio, lead singer/guitarist for The Smithereens, and a friend he introduced as Tommy Beatle, performing as The Scotch Plainsmen. DiNizio is uniquely qualified to comment on Beatles music, having recorded the CDs Meet The Smithereens, a note for note recreation of Meet The Beatles, and B-Sides Of The Beatles, with his New Jersey based band. Between songs, DiNizio spun tales of hearing his first Beatles song at age nine while brushing his teeth, and how it took the sage advice of an older cousin for him to fully appreciate “Penny Lane” when it first came out. There was also a funny story about his mother calling him in the middle of the night back in the mid 1980s to let him know that The Smithereens had been listed for The David Brenner Show in the latest edition of TV Guide. British humorist/producer Martin Lewis has served as host of Fest For Beatles Fans on the East and West Coasts since 1992, and has worked on assorted Beatles related projects. In Chicago, he conducts some of the celebrity guest interviews and moderates B.U.I. - Musician’s Forum, which is an informative and entertaining discussion/jam session with some of the famous musicians who have been booked for the Fest. Musician/producer Mark Hudson was once again the most active participant, and while his exuberance approaches a Muppet-like silliness at times, he knows music inside and out, and is a talented performer. Denny Laine and Denny Seiwell of Wings, and musician Gary Wright also helped make this year’s Musician’s Forum another winner. Pretty much everything at Fest For Beatles Fans qualifies as family entertainment, but none of it more so than the Battle Of The Beatles Bands. WXRT air personality Terri Hemmert, marking her 33rd year as MC for Fest For Beatles Fans Chicago, always oversees this amateur hour with gentle humor and an encouraging word, even for contestants who are noticeably off key. It’s common for parents and their offspring to form bands for this event, and any act that features cute kids has a definite edge in making the finals. Some of the better acts this year included The Shades and Hootenanners. 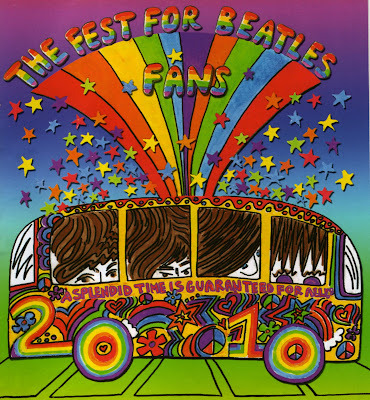 The Art Contest, with participants competing at various levels and age groups, brought in another crop of imaginative works, especially the piece that showed over 30 albums on which the actual Beatles were replaced with their animated counterparts from the 1960s cartoon show; and a huge portrait of the lads in their Magical Mystery Tour splendor. As the night wore on, the people under the stairs began to make their presence known. This unofficial collective has been performing a sort of Mersey beat hootenanny on the ground level of the Hyatt at Fest For Beatles Fans for years. When I stopped by on Sunday, there was a row of about eight guitarists playing Beatles songs to a small crowd sitting directly in front of them on the floor. The joyous spirit of this phenomenon illustrates the bonding power of Beatles music. Liverpool, a four piece band comprised of keyboards/rhythm guitar player Drew Hill, bassist Glen Burtnik, drummer Chris Camilleri, and lead guitarist John Merjave, has developed a loyal following through its performances at Fest For Beatles Fans. At Chicago shows in the past, Liverpool has focused on a single album by The Beatles, but this year, the band bounced from one era to another for sterling renditions of “Glass Onion,” “Let It Be,” “Another Girl,” and “Golden Slumbers.” Unlike many Beatles tribute bands, these guys don’t dress or act like the original band members, they just perform their songs with solid musicianship and amazing vocals. After Laine’s guest appearance, bass player, artist, and longtime close friend of The Beatles, Klaus Voormann came up to play, along with Gary Wright. I must confess that while I’m certainly familiar with Wright’s hit singles, I wasn’t aware of his work on solo albums by Ringo Starr and George Harrison. With Voormann and Wright joining in, Liverpool charged through “Back Off Boogaloo” and “It Don’t Come Easy,” before Wright took center stage for “Dream Weaver” and some of his originals. Wright also sang lead on “To Discover Yourself,” a song he had co-written with Harrison. With Mark Hudson joining in, the concert continued to rock toward its impressive finale. Fest For Beatles Fans had come to Chicago once again, and left those in attendance with a wealth of happy memories. 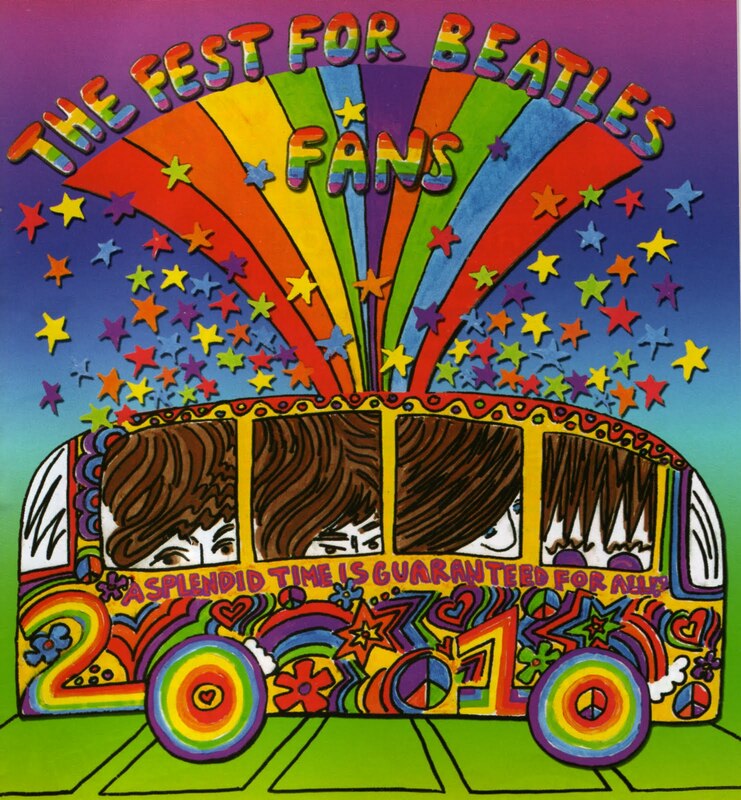 Image taken from Fest For Beatles Fans program. The 34th Annual Chicago Fest For Beatles Fans wrapped things up last night with an all-star fortified performance by the tribute band Liverpool that in itself was worth the price of a day’s admission. The Fest, which kicked off at the Hyatt Regency in Rosemont with an opening announcement by MC (and WXRT radio personality) Terri Hemmert at 5:00 PM Friday and ran through the weekend, once again demonstrated the drawing power of The Beatles. Various guests shared how much the band had changed their lives, either through personal relationships or via musical influences. Even with my attendance limited to one day, I was still able to take in a lot of the event’s multiple treasures. I arrived Sunday afternoon in time to catch British comedian Martin Lewis’s interview with author Chris O’Dell, whose book Miss O’Dell reflects back on her days as an employee of The Beatles’ ambitious but ill-fated Apple company. She recalled George Harrison playfully flirting with her, and how she eventually became close friends with his wife. Patti Boyd. One of the coolest things about Fest For Beatles Fans is an inclusive ambience where well-known musicians, authors, and other performers weave their way through crowded halls and rooms with no hassles. After checking out the O’Dell interview, I wandered downstairs to visit the marketplace, and passed Fest honcho Mark Lapidos conversing with musician/producer/TV star Mark Hudson. A few times during the day, renowned artist and bass player Klaus Voorman walked within a few feet of me. Andy Babiuk, author of the respected Beatles Gear book and founding member of the garage rock band The Chesterfield Kings, was on hand, displaying some of his instruments. The marketplace was filled with dozens of vendors selling t shirts, bags, wallets, belts, caps, guitar straps, calendars, books, buttons, publicity stills, CDs, vinyl, vintage publications, radio station Top 40 surveys, and just about anything that can possibly bear a Beatles logo or image. One vendor sold official merchandise from the current Cavern Club in Liverpool. My favorite item this year was a small guitar pick tin with an eye-catching, black & white Sgt. Pepper band photo on the top. There was also a t shirt for The Traveling Wilburys that caught my fancy. The oddest thing for sale was a toy from the 1960s that was a board with magnetic hairs that you shook until they found their rightful places on a drawing of the Beatles’ heads. A slogan on the package claimed, “Amuses the whole family.” Not any family I’d want to live next door to. The Fest also had some impressive, higher end art for sale, including some Rockstore works from Voorman, who started creating unique portraits of his friends The Beatles from their early performaning days in Hamburg, Germany. Eric Cash and Paul Saltzman were among several talented artists and photographers offering their work for sale. Print and TV model Mike Olie is a sort of Beatles memento come to life. He looks and dresses like a post-Beatles Paul McCartney, and is available to lip synch, or meet and greet at private parties, trade shows, and other special events. I’ve seen Olie at previous Fests, and always thought it would be fun to have this charming impersonator come by when I’m celebrating a birthday with family and friends. At the Fest, he was enthusiastically working the crowd throughout the day. Hemmert’s onstage interview with former Wings and Moody Blues member Denny Laine offered interesting vignettes from both of the involved parties. Laine revealed that he and the other Moodies had been friends with the Beatles from the very early days. He also recalled visiting a Pirate Radio ship and seeing empty Heinekens bottles floating around it. Hemmert harked back to her first interview with Laine in Chicago when he was still with Wings, and how Linda McCartney helped her remain calm as she prepared to interview Paul. Coming tomorrow: Pat DiNizio at Beatles Storytellers; The Musicians Forum; Battle Of The Beatles Bands; an Art Contest; People Under The Stairs; and Liverpool Rocks The House with special guests.